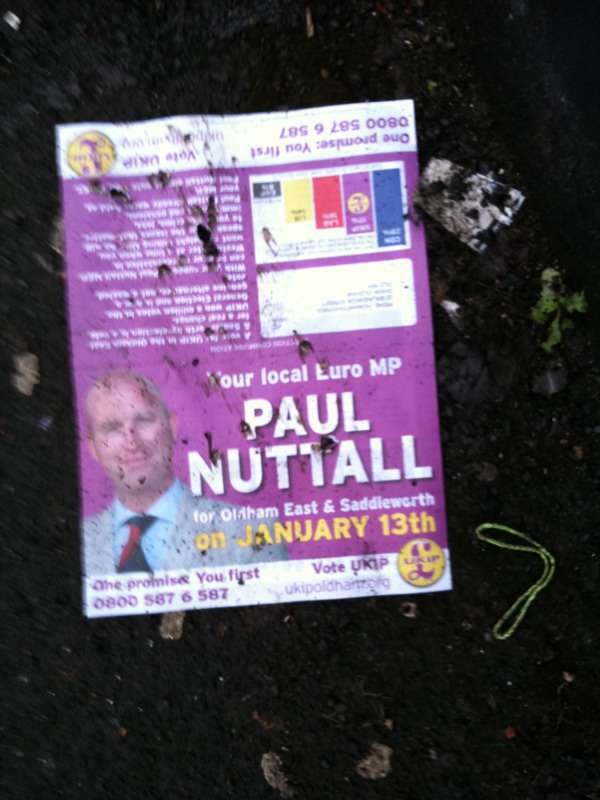 Nuttall, in a recent speech (LINK) to the party faithful, said that it was essential for them to beat the BNP. Again, the only aim of the election is to beat the BNP, I thought they were a finished party with no members and huge internal rows. Not much of an aim is it. UKIP know it too, so you have to ask yourselves what are they trying to achieve which such rhetoric? As we saw in the EU elections when Paul campaigned solely using the B-N-P as his only campaign with no mention of policies, it didn't work as Nick Griffin became an MEP. Nigel's been very quiet on the whole grooming issue, well it's nothing to do with the EU I suppose so just like all the other issues closer to home than the EU that the establishment ignore, we can ignore it too. Quite clearly UKIP just don't have the nerve to tackle the real issues affecting Oldhamers, in that sense Paul would make a perfect MP, as useless as the rest of them in there. As Lord Pearson has said that UKIP will disband when the Conservatives take us out of the EU, I'm sure Paul would be very welcome in the coalition. I see there are problems with the lighting in your 'top of the range' office. Did Mr. Wheeler come specially to Oldham to put a few quid in the meter, didn't realise things were that bad. Paul's hand gestures made me want to turn the volume down for some reason, then I realised on doing so how much that video needs a Nuremberg Rally soundtrack. As Godfrey once said Ein Volk, ein Reich, ein Führer. Doesn't quite sound the same in scouse though. But the odious Nuttall's hatred of that BNP certainly can't be anything to do with their political views because UKIP's very own Benito is happy to sit with extremists in Farage's EFD group!